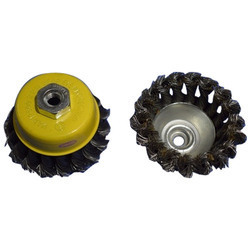 Cup Type Wire Brush "twisted" S.no Size / Thd / Type 1 2-1/2" X M10 Twisted2 3" X M10 Twisted 3 3" X M14 Twisted 4 4" X M14 Twisted 5 4" X M14 Double Twisted Cup Type Wire Brush "crimped" 1 2-1/2" X M10 Crimped2 3" X M10 Crimped 3 3" X M14 Crimped 2 4" X M14 Crimped Circular Type Wire Brush "twisted" 1 3" [75mm] Twisted 2 4"
Our company has gained name and fame in presenting Twisted Cup Brush. 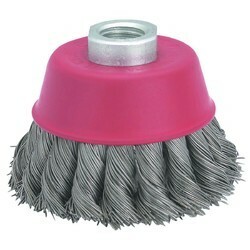 These Twist Knotted Circular Cup Brushes are made from very high quality raw material which ensures hassle free work performance at its user end. These Twist Knot Cup Brushes are widely finds its applications in various industrial sectors.